It's official. Bakery Bar is my new favorite Web site! For one thing, they are the creators of what has to be the cutest cake I have ever seen!! I stumbled upon it on Sunday and I can't stop thinking about it!! I mean look at it! How can you not fall in love with it?? Unfortunately, realistically speaking, my palate isn't quite so excited, given that it's completely covered in fondant. Topic: Why oh why can't someone invent a delicious tasting fondant?? Discuss. 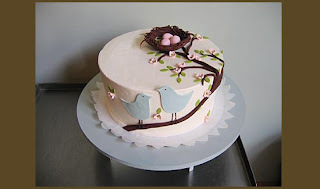 For more lovely, albeit fondant-covered goodies, check out their Web site. There's a whole lot more to see! Yeah, I've heard that marzipan is much tastier than fondant. I'll have to try it sometime. Nice job with the cake, btw! It's really cute! I think that you should have this cake, for MY birthday. That is a gorgeous cake, I too want to meet it. Interesting! I guess there is hope for fondant, after all! Adorable. Btw, that's fondant over buttercream. It's not completely covered in fondant.